3 in 1 Design charging holder allows you to charge your apple member together; Precise holes and cable slots keep the charging cable neat. No more tangle cable. 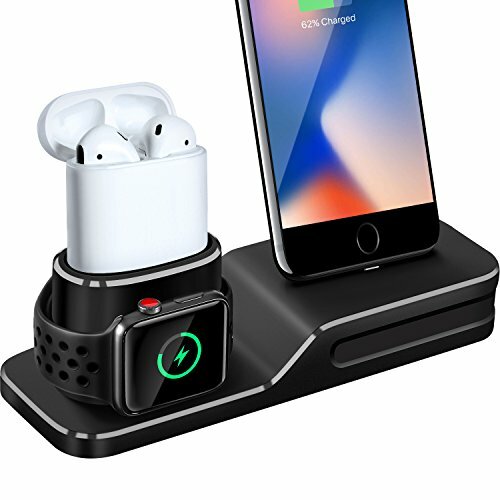 When charging the apple watch, the apple watch stand charging dock screen will light up, and display the charging symbol, after several seconds the screen will get dim, but keep charging to provide you a good sleep atmosphere. Without rough or jagged edges, but constructed of refined finish, the surface of the apple watch charging dock is smooth, providing comfortable and impressive touch. Push the iPhone series charging cable strongly from the bottom of the stand into the hole; Note: before charging the iPhone/ airpods with case, the cable tip edge should be higher than the edge of the hole. The watch adapter cable should go through the round hole on the left, secure the charging pad into round slot. The charging stand is only compatible with the original charging cable of the apple member. The charging cable, adapter and watch are not included. This is a compatible spare part, the brands and models have been mentioned above for reference purposes only.